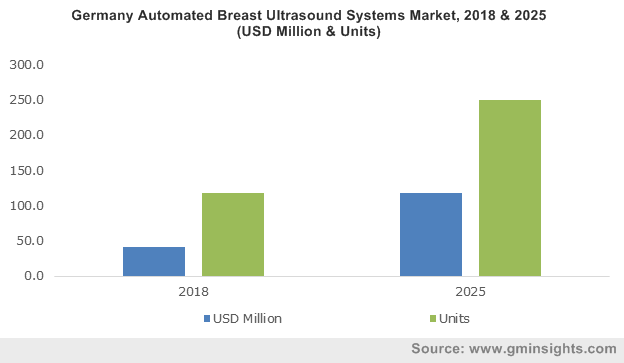 Automated Breast Ultrasound Systems Market size was valued over USD 590 million in 2017 and is expected to witness more than 16.0% CAGR from 2018 to 2024. Rising prevalence of breast cancer across the globe is a major growth rendering factor for automated breast ultrasound systems market. As per World Cancer Research Fund International (WCRF), breast cancer is the second most common cancer in the globe with 1.7 new cases diagnosed in 2012. Early menarche, late pregnancy and menopause, smoking habits, alcohol consumption and high exposure to oestrogen and progesterone are major risk factors associated with rising breast cancer cases, thus, driving demand for automated breast ultrasound systems. Favourable government initiatives and laws made to increase awareness among the target patient pool resulting in early and effective disease management will drive automated breast ultrasound systems industry size. For instance, implementation of density notification laws in various states of U.S. that requires physicians to inform women about their breast density along with the additional imaging modalities available will foster demand for ABUS in the future. Enhanced ability of ABUS to effectively screen women with dense breast tissue thereby stimulating cancer diagnosis rate by 55% in contrast to mammography will escalate industry growth. However, excessive cost associated with automated breast ultrasound systems along with lack of skilled personnel for interpreting data will hamper industry growth over the forecast timeline. Automated breast ultrasound systems (ABUS) accounted for largest market share in 2017 and is projected to reach USD 868.7 million by 2024. Advantages offered by ABUS over the conventional ultrasound systems such as high reproducibility, consistency and high-resolution images will drive business growth. Automated breast volume scanner business segment will witness lucrative 16.5% CAGR over the coming few years. Increasing focus of industry players to develop novel technologies owing to rising incidences of breast cancer along with benefits offered by such advanced systems will drive industry expansion. Hospitals business dominated the automated breast ultrasound systems market in 2017 with revenue share of 61.3% and expected to follow similar trend throughout the forecast period. Increasing usage of ABUS in hospitals for screening breast tissues providing effective outcomes along with presence of skilled professionals are factors contributing towards its higher market share. Diagnostic imaging centres business will grow at a CAGR of 16.5% over the forecast timeline owing to rising adoption of ABUS for early detection of small tumours present in dense breast tissue. China automated breast ultrasound systems market share was more than 63% in 2017. Rising breast cancer cases due to sedentary lifestyle, smoking habits, heavy workloads will drive industry size. Increasing adoption and upgradation of ultrasound systems in hospitals along with awareness initiatives for breast cancer in the country will further augment industry progression. U.S. automated breast ultrasound systems market will drive North America ABUS industry over the projection years. By 2017, the U.S. market was valued over USD 140 million. Growing incidence of breast cancer cases along with favourable regulatory scenario are major factors contributing towards regional growth. Several awareness initiatives organized by government & private societies to increase awareness levels will propel industry proliferation. For instance, establishment of National Breast and Cervical Cancer Early Detection Program (NBCCEDP) by Centers for Disease Control to improve access towards breast cancer screening and diagnosis among low-income women will spur regional market growth. Germany automated breast ultrasound systems market is expected to witness 11.9% CAGR over the forecast period. Increasing support for raising awareness levels about breast cancer care along with presence of well-established industry players developing novel advanced volume scanners are major factors contributing towards market growth. 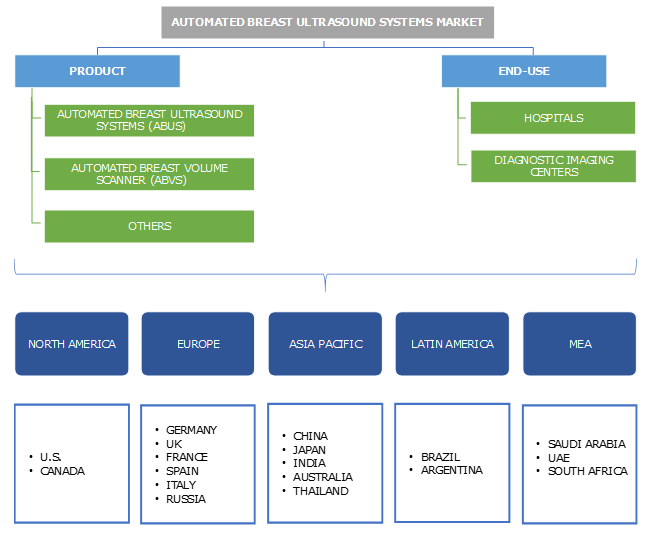 Some of the major players operating in global automated breast ultrasound systems market are GE Healthcare, Siemens AG, Koninklijke Philips N.V., Hitachi Ltd. and SonoCine Inc. among others. Various manufacturers are introducing innovative and advanced ultrasound systems in the market to stay ahead in the competition and grab high foothold. Rising government focus on reducing disease burden owing to increasing prevalence of breast cancer across the world will drive global automated breast ultrasound systems industry. Launch of various government initiatives to boost awareness levels among women will further accelerate industry growth. Emerging countries such as China, India, Brazil will provide lucrative growth opportunities over the coming years owing to increasing incidences of breast cancer cases among women. Rapid technological innovation such as launch of Invenia ABUS that enables to obtain high-resolution images and enhances the cancer detection rate leading to effective disease management will accelerate industry size.